Any person who loves the movie experience will love home theatre popcorn machines. These compact yet fully operational machines provide the same great-tasting popcorn commonly found in many popular movie houses. Utilizing the same standard stainless steel kettle popping technology, these machines are durable, cost-effective, easy to clean and rustproof. The main difference between home theatre popcorn machines and their large theatre cousins is mainly to do with size. Full theatre popcorn machines are designed for the tasks of high-volume popcorn production. Small or medium-sized popcorn poppers are more suited for home use yet are powerful enough to make at least 120 one-ounce servings per hour. 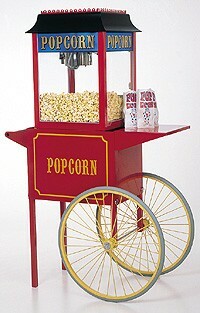 Some of the most fanciful home theatre popcorn machines are designed to mimic the old-fashioned popcorn carts of America's past. These quaint and nostalgic machine-and-cart combinations are good as extra-special decorative home theatre touches. They can also be quite popular at birthday parties, school funtions, Fourth of July celebrations, and church-run carnivals. In addition to these venues, popcorn machines and carts are growing in popularity at nursing homes, corporate employee appreciation functions, and little league concession stands. To see our selection of nostalgic, old fashioned, pool style and contempo popcorn machines for home theaters, visit our home theater popcorn machine page. Most movie enthusiasts would agree that the entire popcorn-eating experience is not complete without the right movie popcorn accessories. One can purchase the same types of popcorn bags, popcorn buckets, salt dispensers, flavorings and popcorn seasonings, and scoops that the professionals use. In a person wishes to go full force and push his home theater experience to the limit, he can install a heated butter dispenser next to the popper machine as well. 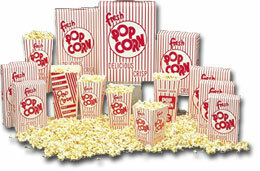 For a great selection of popcorn packs, seasonings, boxes, tubs and more..click on popcorn supplies. Nostalgia Electrics Make your home parties come alive with the Nostalgia Electrics Party Home Appliances that includes nacho and Mexican fiesta carts, mini hot dog roller grills, mini popcorn poppers, snow cone and cotton candy carts, chocolate fondues, and mini vend soda machines. Standard Concession Supply also features candy peanuts, salted peanuts, popcorn gifts, popcorn bowls, and commercial popcorn, snow come, and cotton candy machines.